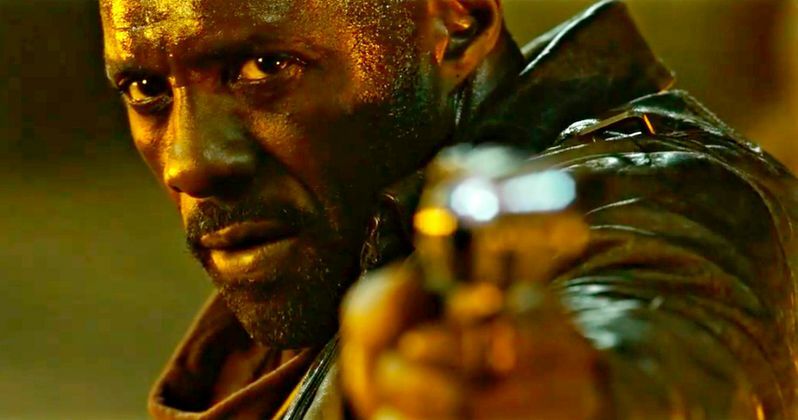 After years of lingering in development hell, Stephen King's novel series The Dark Tower is finally coming to the big screen this summer. Director Nikolaj Arcel (The Girl With the Dragon Tattoo) is the man who has been tasked with bringing the beloved work to life and, with the movie is set to arrive in theaters next month. We have finally been given another look at the movie. This latest trailer for The Dark Tower is easily the best one yet, and may help sell more general audience members on it. Sony Pictures has released a brand new, international trailer for The Dark Tower, which gives us a bunch of new footage mixed with some of the better shots from the first trailer that was released a couple of months ago. This trailer not only gives us some awesome new footage to absorb, such as the beam down to the tower, but also some more of Mathew McConaughey as the Man in Black, doing rad action-movie bad guy stuff, and a lot more of Roland doing some really cool gunslinging and bullet discharging. After years of waiting, this trailer may be the best piece of evidence to date that The Dark Tower movie won't disappoint. The Dark Tower follows Roland Deschain (Idris Elba), the last Gunslinger, who is locked in an eternal battle with the Man in Black (Matthew McConaughey). Roland is determined to prevent him from toppling the Dark Tower, a mystical physical tower that holds the universe together. With the fate of the worlds at stake, good and evil will go toe-to-toe in an epic battle that will settle this thing once and for all. Sony has positioned The Dark Tower to be the cap to the summer movie season, with the movie set to arrive on August 4, 2017. In recent years, August has become very fertile ground for sneaky hits. Guardians of the Galaxy and Suicide Squad both managed to surpass expectations coming out around that time. Sure, those are both superhero movies, but Stephen King has a very loyal following and with IT also coming out this year, there is a lot of renewed excitement for adaptations of his work. If the movie is actually good, Sony could wind up with a big hit here. Reviews will be very important for The Dark Tower. Not that they aren't always, but this doesn't feel critic-proof in the way that movies like Suicide Squad managed to be. There are plans for potential movie sequels and a companion TV series for The Dark Tower, should the box office take justify it. So fingers crossed that this is the adaptation that fans have been waiting literally decades to see. If nothing else, it will be fun to try and spot all of the Stephen King Easter eggs that have been placed in the movie. Be sure to check out the latest trailer for The Dark Tower for yourself below.